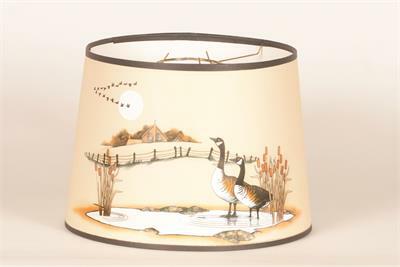 This 10 1/2" parchment (paper) lamp shade features a pair of Canada Geese in a field, earth tones. 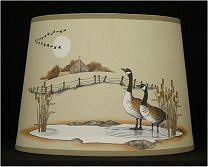 Adds a rustic feel to any room. The updated S100C shade from Aladdin Lamps now comes in a 10 1/2" smaller diameter size but includes a built in, chimney mount style, wire shade support. Tripod not required with this smaller shade! 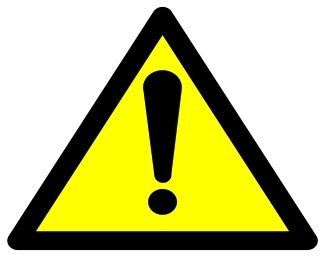 For use with all Aladdin lamps. 10 1/2" base diameter.